Emerging countries did not only master the global financial crisis better than most early-industrialized countries, they are also expected to account for the major part of the world‘s economic growth during the coming years. In the forefront of this development are China, India and Brazil. By fall 2010, China has become the world‘s largest market and production base for construction machines and material handling, while India is expected to take the place of the world‘s fastest-growing large economy for the coming two decades. Brazil seems on a stable growth path as well, and is expected to become the world‘s 5th largest economy by 2015, surpassing France and Great Britain. Since the economical growth of these countries is driven by huge infrastructure programs, urbanization and industrialization, the markets for mobile working machines will grow even stronger than their GDPs. More industrially produced goods for domestic and international sales require logistics and material handling equipment. The change from rural to industrialized societies requires a modernization of the agricultural sector. 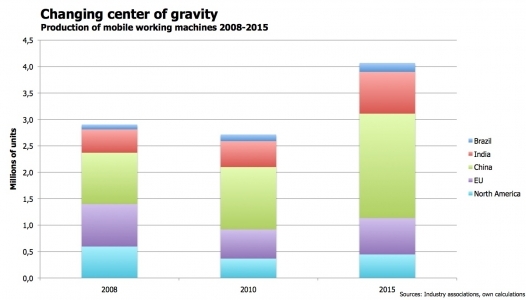 Thus, the centre of gravity in the world‘s mobile working machinery industry is changing. Machine manufacturers and component suppliers have to adapt to it. This development is an opportunity to profit from attractive growth markets and to make your business more independent from ageing, indebted traditional markets. Due to the comparable weak base of domestic suppliers of hydraulics, drive technology and heavy engines in the emerging markets, they are in particular attractive for established component suppliers from these industries. Our new multi-client study offers you profound insights into these markets. All relevant companies are profiled (production facilities, production volumes, product portfolio). We would be delighted to assist you with our services. For more detailed information, please visit our multi-client-study-website, contact us under info@stm-stieler.de or just call +49 7621 55 00 440.